This will be just perfect with a prepaid data SIM. 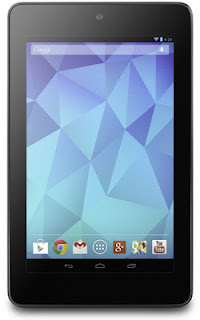 The 32 GB Nexus 7 3G version will be on sale in Japan from 2/9 at major electronic stores for ¥29,800. That is by far the best deal in Japan for a 3G tablet. It uses a micro SIM card. List of b-mobile SIMs here. This would also be perfect for Ingress. You had to put in an Ingress comment didn't you. And tagged the post with ingress, too. Actually, the data-only SIMs connect to mopera APN and aren't IMEI filtered. Only the voice+data (smartphone) sims are). So you could use this with a FOMA data contract I think. Unless something has changed recently, that is. And, yes, I realize that makes no sense. Obtained at Yodobashi Akiba. Bic Yurakucho had signs out but no display model or stock. So you're saying if I choose the 9975/month data-only docomo plan (below) then I can use any non-docomo device with the open.mopera.net APN? That's perfect for the N7! My friend's living in Japan. I want to Xperia S from him. But I can't see any online store from Japan on Internet. How can find it? Do u know How much Xperia S?? Hi Tom... Let me know that it runs w/o SIM.